They look much better in person: chunky, muscular and big. 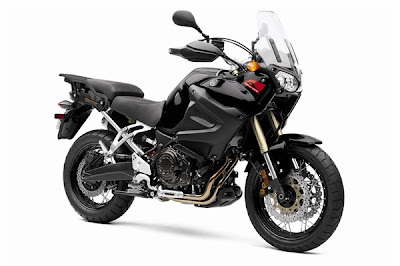 I also need a bike that is fast, even when loaded, comfortable and to be capable of both on- and off-road. I think the Super Ténéré has all the right stuff that will put a big grin on my face. Big, sneaky-fast, comfortable and surprisingly capable on- and off-road, Yamaha's transcontinental über-tourer has the right stuff to give its most obvious competition something new to worry about. There are too many places out there to be explored and I'm always ready for adventure both on- and off-road, I think the Ténéré will suit me well. The hardest part of laying down a $500 deposit on one of these things will be waiting all winter for the bike to show up in May. But when it does, you won't be disappointed. I can't wait for May to get here, in the mean time I will be making my Christmas list, hopefully I have been a good boy and Santa will be nice to me. THe joy of waiting for a new bike, can be unbearable. Looking forward to hearing all about it, I am very interested inseeing what the new Triumph Cub is gonna look like and its reviews when it finally gets out.